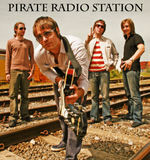 Sign up for Broadjam today to follow Pirate Radio Station, and be notified when they upload new stuff or update their news! 12 brilliant Rocksongs written by Sebastian and Paul! You can find slow sad songs on it, but you can also find great hard rocktunes! Seven live-tunes, pure Rock´n Roll! A selection of our early demo songs. The Quality is not perfect but the songs rock!